If your group is looking to see the city from a unique perspective, why not make a splash with our SEAL Tour? Whether you’re hosting out of town guests or just getting together with friends, our sea and land tour is the perfect way to entertain a big party! Your 90 minute, fully-narrated, San Diego Group Tour departs from Seaport Village or Embarcadero. Enjoy picturesque San Diego sights while cruising through its calm waters aboard our comfortable amphibious vehicle! Experience the history and ecological wonders of San Diego in the comfort and security of our virtually unsinkable Hydra Terras. Here you will learn first hand of our rich military history and cruise through the waters that are the playground of the California Sea Lion. Don’t miss this exciting, entertaining adventure of a lifetime to see America’s Finest City as you have never seen it before! 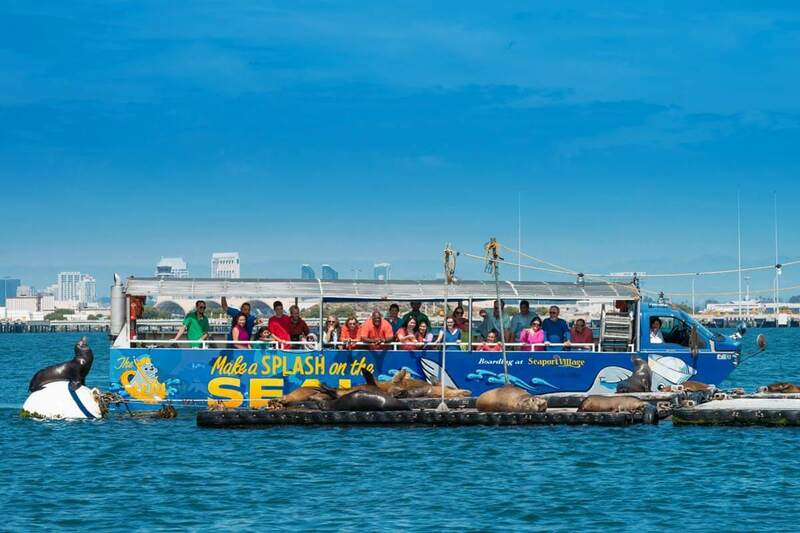 Pre-purchased group tour tickets are available for groups of 15 or more and private charters are available based on a 40 passenger maximum per SEAL vehicle. *School group tours may also be arranged. Our Sea & Land package allows your guests to see all the best San Diego attractions! E-mail Erica Frost and Jeanette Perez or call (619) 298-8687, option #4. Join our email list and you’ll be the first to know about our upcoming offers and promotions!